You did it. After almost an hour of navigating a website, filling in information fields and copy and pasting your resume, you’re ready to send in your online application. After a quick review, you scroll your mouse over to the “submit” button. And that’s it. Sometimes, it feels like you’re sending your application materials off into thin air! As a job seeker, you’re eager to make contact with a potential employer. But, depending on the position you’re applying for, it could take days, weeks or even months before hearing back. All the while, the questions of, “Did they even see my materials?” and, “Will they ever call?” nag. Social media is an increasingly useful tool for employers and job seekers alike. Take this opportunity to seek out your top organizations across all social channels. By listening to, and occasionally engaging with, the conversations being started by these organizations, you can learn a lot about their culture and values, as well as gaining opportunities for contact. LinkedIn is a fantastic, professional platform to use as a starting point. By following company profile pages, you can not only be updated of new job openings, but also be a part of industry-specific conversations in a more business focused environment. On Twitter, retweets and direct messages give you additional opportunities for engaging. Facebook, Instagram and even Pinterest are being used more and more by companies, so be creative! You don’t need to be best friends with the CEO to get your foot in the door! From interns to directors, any contacts you might have in an organization have the potential to give you an exclusive window into their world. Rather than immediately requesting openings from these connections in your network, use this as a chance to learn more about the corporate culture first-hand. The human touch makes a meaningful impact. Career fairs, community events and industry gatherings are all exciting ways to make in-person contact with representatives from a variety of companies. These events can give you special insight into the causes and initiatives that potential employers value. Recruiters may even be in attendance, providing information about the application process and available positions. Do your research beforehand to know what to expect from each event, and prepare accordingly. Reaching out to a new company is a way to be noticed outside of your application materials, but be careful; too much of a good thing can turn your introduction sour. Constantly messaging an employer via social media, e-mail or in-person for available positions and application status updates can paint you as unprofessional. Virtual applications allow job seekers to find and apply for more available positions than ever. However, it can get pretty lonely when you feel as though your information is lost in cyber space. Think outside of the box and embrace new ways to get in touch with organizations that interest you! Do you have any other ways to make contact with a potential employer? Speak up below! 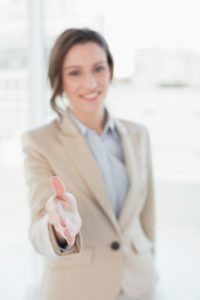 This entry was posted in Job Seekers and tagged career fairs, first impression at a job interview, first introductions, Job Search Advice, Networking, social media advice. Bookmark the permalink.